A thoughtful gift idea for any cooking enthusiast, this Mezzaluna knife and bowl set by Shun are a dynamic duo when it comes to food-prep convenience. Appropriately named Mezzaluna, or "half moon" in Italian, the uniquely shaped knife features a curved 6-inch blade and handle that enable a rocking motion for smooth, effortless chopping of onions, carrots, peppers, and other vegetables, as well as the mincing of herbs such as basil, cilantro, and parsley. 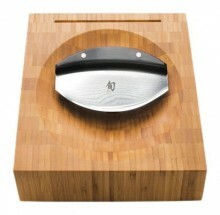 The set's bamboo bowl nicely accommodates the shape of the knife while also adequately containing the cut pieces. Furthermore, the knife's wide blade makes it possible to scoop up and transfer food from the bamboo bowl to awaiting pots and pans. Overall, the set measures approximately 9-1/2 by 9-1/5 by 3-1/2 inches. Like other knives in Shun's Classic collection, the Mezzaluna knife comes precision-forged in Japan by renowned blade manufacturer KAI. Its eye-catching beauty starts with a VG-10 stainless-steel blade, which features 16 layers of SUS410 high-carbon stainless steel on each side, producing a 33 layered Damascus look, but without the rusting problems associated with Damascus. The Damascus detailing not only enhances the knife's aesthetic appeal, but it also prevents morsels from sticking and helps maintain the integrity of food when slicing. The knife's sleek good looks continue on into its handle. The unique ebony Pakkawood handle consists of a fused blend of hardwood veneers and resin to exceptionally noteworthy results. Though dishwasher-safe, Shun recommends washing the knife by hand for best results. Click the button below to add the Shun Mezzaluna 6 inch Knife with Chopping Board Bowl to your wish list.